This retreat was a return visit to Mount St Bernard’s Abbey, 15-18 October 2018, attended by thirteen oblates from Prinknash, Minster, Quarr, Ampleforth, Salisbury, St Cecilia’s, Alton, Hyning and WCCM. The theme of ‘Look to Him and be Radiant’ was explored by Abbot Dom Erik Varden OCSO and Sister Mary Philippa OC, Bernardine Sister of Brownshill Monastery. Sister Mary Philippa introduced us to the meditations of William of St Thierry, from ‘On Contemplating God’, while Abbot Erik led us via the Rule of Benedict, biblical and literary pathways to consider the nature of contemplation. Many of us bought his book ‘The Shattering of Loneliness – On Christian Remembrance’ and have begun to reflect on its riches. On a lighter note, we enjoyed sampling the Abbey’s English Trappist Ale, ‘Tynt Meadow’ at our final supper. 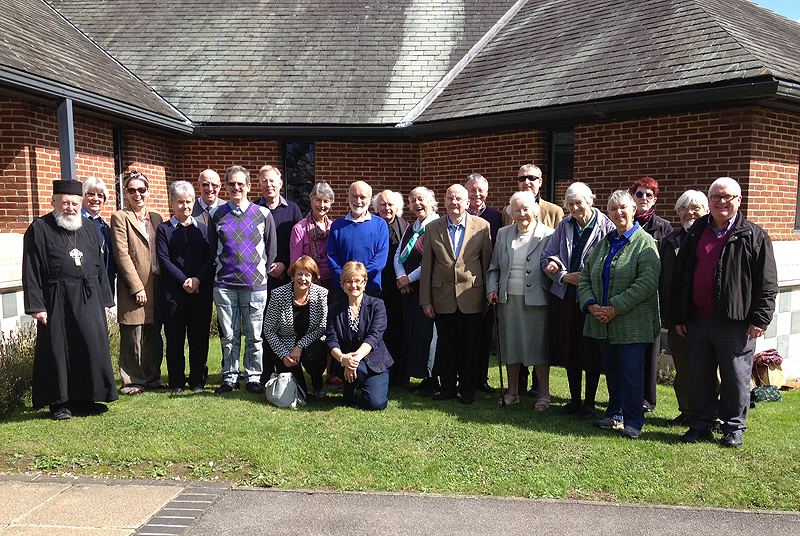 was held at Douai Abbey 24-26 March 2017 and was attended by 17 oblates from Minster, Mt St Bernard, WCCM, Chilworth, Prinknash, Ampleforth, Saccidananda Ashram, Douai, Salisbury and Quarr. 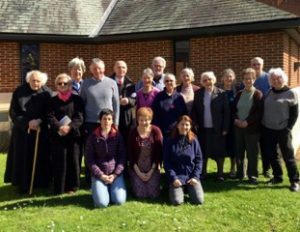 Two years ago when we were at Douai on retreat we welcomed an oblate who was in her 99th year – you can imagine how delighted we were to welcome her back this time, now in her 101st year! Yvonne was a wonderful example to us all. It was a truly blessed 48 hours which were very much enhanced, yet again, by our facilitator, Fr Gervase, the oblate master at Douai. The theme was ‘Living as an Oblate in 2017’ – we began as comparative strangers and left as good friends. 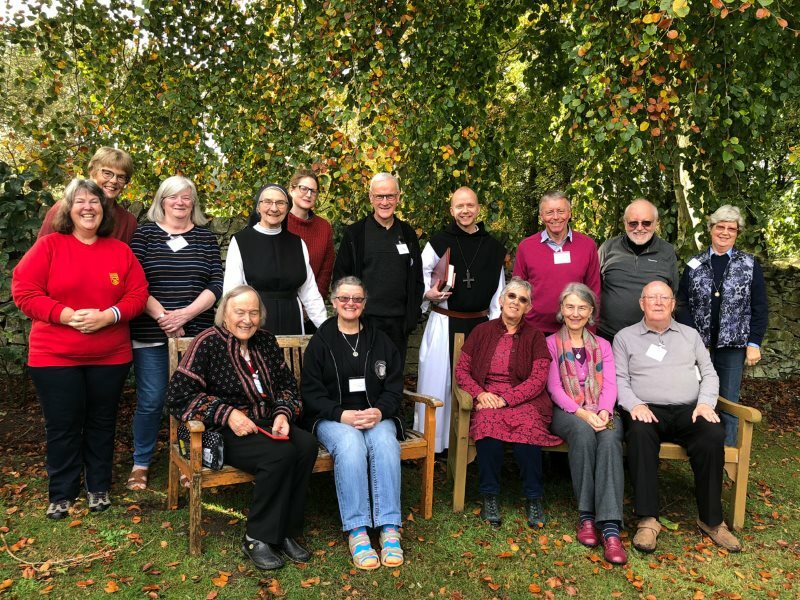 This was our most successful Retreat and it was enjoyed by 18 Oblates – 3 from Prinknash, 4 from Minster, 2 from Pluscarden, 1 from Tyburn, 2 from WCCM, 1 from Stanbrook, 2 from W Malling, 1 from Salisbury, 1 from Quarr, 1 from Costock . 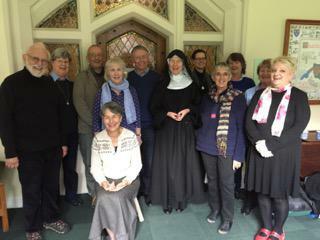 As the flyers suggested the Retreat was led by Abbot Erik Varden, the abbot of Mt St Bernard, and assisted by Sr Laurentia Johns, the oblate mistress of Stanbrook. 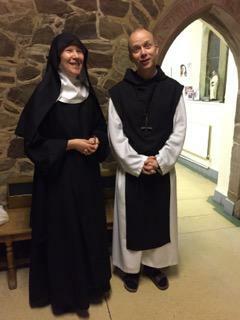 The theme was ‘The Monastery : A place where the depths are met in Jesus Christ’. The Retreat lasted an extra day – 4 instead of the usual 3 – this was most beneficial as we were able to absorb and digest what we had received from our two wonderful ‘leaders’. The ambience of the Abbey – its Offices, its daily celebration of the Mass, its spacious and attractive grounds – all assisted in our enrichment of this Retreat. 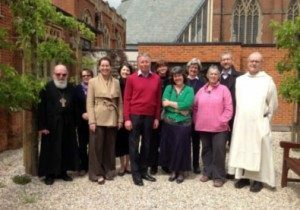 We have been invited back – an invitation we are looking to accept …..
5th National Retreat for Benedictine Oblates took place 4-6 September at Douai Abbey, with the Facilitator, Fr Gervase Holdaway, their Oblate Director. It was a most successful and enjoyable Retreat and there were 21 Oblates present, representing 10 monastic communities. It was a truly wonderful weekend where we all grew in spirituality and in our love and respect for each other. 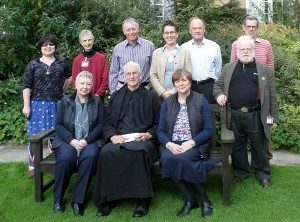 l-r: Fr Leonard Hollands (Salisbury); Pam Morey (Prinknash/UKOT); Klara Brunnhuber (Douai/UKOT); Susan Sims (Community of St Marty the Virgin, Wantage); Peter Scott-Smith (Ampleforth); John McKinlay (Pluscarden/UKOT); Kevin Sims (Mirfield); Mary Jones (Prinknash); Frances Bailess (Minster/UKOT); Zina Neagle (Douai); Robert Jones (Prinknash); Fr Gervase Holdaway (Douai); Eileet Dutt (WCCM); Fred Bonham (Salisbury); Stephen Day (Prinknash/UKOT); Yvonne Fox (Ampleforth); Thomas Brunnhuber (Douai/UKOT); Jenny Walker (Douai); Sue Thomson (Prinknash); Sara Baxter (Ampleforth); Gerry Reilly (Salisbury); Neil Zoladkiewicg (Ealing). The gentle leadership and words of Fr Matthew Burns are still echoing through my mind – 24 hours after the end of a wonderfully spiritual weekend at Ampleforth Abbey in Yorkshire. Oblates from Douai, Ealing, Pluscarden, Prinknash, Salisbury and Stanbrook gathered in The Grange for a series of talks by Fr Matthew centreing on Prayer, Praise and the Trinity. Although not part of the Retreat, Mass on Sunday in the school chapel, accompanied by over 650 pupils from the school, added to the overall delight of the weekend. We had all travelled some distance and just wish it were easier to revisit Ampleforth again before too long. 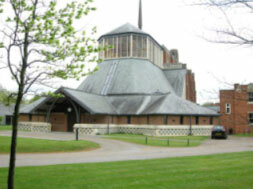 For those Oblates who have not yet sampled a National Retreat, organised by the UK Oblate Team, you might like to put in your diary 4-6 September 2015 when the Fifth Annual Retreat will take place at Douai Abbey. More details will be posted on this website in due course. I recently travelled to the Holy Land with the Clifton diocese which was a wonderful experience. We started our journey at the primacy of St Peter where we gathered for Mass under the shade of a tree on the very shores of the Sea of Galilee, a deeply evocative and personal experience walking in the footsteps of Christ along with 90 new companions on the same journey. We visited two Benedictine sites, the first was the church of the Multiplication on the site of the miracle of the loaves and the fishes where thousands of people were fed by Christ and his disciples. The church was busy as coachloads of people streamed through but there was still the opportunity to go apart a little and enter the stillness of the place. We travelled extensively, from Tiberius in Galilee to Capernaum, to Nazareth and Cana, to Jericho and down to the river Jordan, to Bethlehem and finally to Jerusalem. In Jerusalem we stayed just inside the gates of the old city near the Armenian quarter, an interesting labyrinth of streets and shops selling beautiful crafts and pottery and everyday necessities, brightly coloured foods and pastries, sweet shops, leather goods, religious articles, all standing side by side. The old city of the Via Dolorosa where men trundle barrows of wares through the narrow streets, is a city teeming with life, a vibrant city deeply connected with its past and its troubled present, a land where faith is woven into the fabric of the place and the people, an integral part of the life of the city itself, in a land where people have not forgotten the art of blessing and maintain a deep awareness of the presence of God in their lives. We walked out of the city walls to the Benedictine Dormition Abbey, a building sponsored by the Kaiser in times past, another curious reminder of times of conflict and war in a peaceful place. This building houses many small chapels arranged in circular fashion around a spacious centre giving a great feeling of peace and tranquillity. There is an area devoted to Our Lady with a statue of Our Lady in repose and around the corner a small chapel devoted to the Blessed Sacrament. All the chapels in the Dormition Abbey had very beautiful artwork in different styles with intense colour and tremendous detail wherever we chose to look but everywhere there was a sense of peace and serenity. 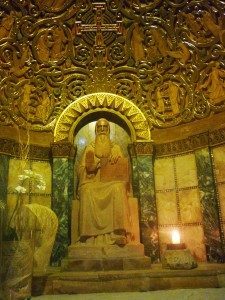 There was one chapel which puzzled a few of my fellow pilgrims; this held a statue of a man with a long beard, holding a book, above him a distinctive cross woven into the artwork of the ceiling of the chapel. There were different possibilities raised as to who this may be and I found myself explaining the story of St Benedict whilst holding my novice oblate medal of the same cross which I touched against the altar. We had a very intense journey, people quickly fused from many different places into one caring community, looking out for one another and bearing with each other with humour and tolerance and good nature. We were grouped into two separate coaches, the green conforming coach who wore their hats as requested and usually went first wherever we went and then the red rebellious bus who wore their hats back to front if at all and tended to go off at will and savour the places we visited. This created a great sense of camaraderie and was a source of endless banter for the week. We all sat quietly in a church one afternoon before starting the stations of the cross along the Via Dolorosa. One of our group priests, Fr Christopher, sang the Alma Redemptoris Mater with great beauty into the silent expanse of that church, into the group silence as we waited and prayed before setting out on that journey with Christ, a heartrending journey ending on Calvary in the sorrow and triumph of the Cross, a journey made together, alone yet in company. We were asked to take a companion along with us on our journey. I chose two; St Peter and St John, both symbols for me of great strength and devoted love. I felt strongly that we also journeyed with Peter on this pilgrimage. As we travelled from Jerusalem to Bethlehem through the checkpoint at the dividing wall I noticed a single pink rose growing up against the barbed wire surround. A few days later we visited the garden of Gethsemane where there was also a rose bush with a single pink rose just before we went into the church of all nations. This struck me as a hopeful message, a message of peace that we all need to pray for. We were blessed with a beautiful pilgrimage shared with a diversely gathered group of people. The week for me was summed up by an unexpected comment made over breakfast by a fellow pilgrim that we need humility and obedience, which seemed to me to sum up the essence of pilgrimage and the essence of the Benedictine life; humility, obedience, prayer, silence, solitude and companionship in community, accepted and valued as we are, free to be truly ourselves. I was very blessed to share my pilgrimage and a lot of fun and laughter with a very dear friend of mine who became increasingly like a sister to me, reminding me yet again that we do not travel alone but we are given great gifts of friendship as we journey through our lives. Jane Coll, who lives in the North of Scotland, is an oblate of Pluscarden Abbey and a valued member of the UK Oblates team. Having completed a BA Divinity through the Maryvale Institute, she has now written a book on the role of women in the Church. The book has been granted an Imprimatur by the author’s bishop. ● It takes up the challenge of Pope Francis to investigate further the role of women in the Church”. 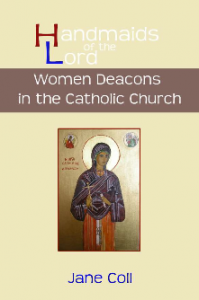 ‘Handmaids of the Lord: Women Deacons in the Catholic Church’ is published by Gracewing and can be purchased through their web page, www.gracewing.co.uk., bookshops or on Amazon. 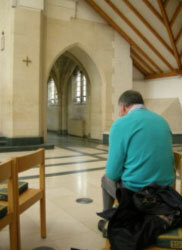 Over the weekend of 10-12 May 2013 a group of Oblates were at Douai Abbey enjoying a retreat led by the Prior of Prinknash Abbey, Fr Stephen Horton. ‘The Observing Self’ turned out to be a wonderful couple of days of self-discipline and relaxation. The group decided that Breakfast and Lunch would be celebrated in silence each day, but that breaks for refreshment and Supper would be open to speech if we chose. We had been told that the aim of the retreat was to bring about awareness through observation. Two types of sessions would take place – firstly we would disperse to choose any object that we wished to draw. We were told that whilst this was to be an artistic experience, no previous experience of drawing was necessary as this was not a competition in drawing and so no one needed feel shy or inadequate. The drawing part would bring the mind to a place where it could receive (take in) the seen world. Apart from an introductory talk by Fr Stephen we only met once more as a group when we were encouraged to share our experience(s) of what drawing was like for each of us and what effect it had had. This was a very interesting session and apart from one retreatant who found it easier to sculpt rather than draw we each were pleasantly surprised with the result. Again, we were advised that like prayer itself the act of drawing tends to still the busy mind. Such a process thus puts the ego in the back seat and lessens its constant need to dominate the world. Drawing tends to obliterate the distance between the observer and the thing observed. The result is a sort of fusion between the two. As in prayer, the distance between God and the one praying seems to be abolished, so in the act of drawing, a similar fusion takes place. Of course, in prayer, God and the one praying are not the same – so in drawing the one doing the observing and the thing observed are two – it is what happens in between that is mysterious. We agreed that the 3rd National Oblates Retreat was a good retreat from which we all benefited. The UK Oblates Team will certainly be looking to arrange a 4thNational Oblates Retreat in 2014 – so watch this space for a date and venue. Click 2nd National Oblates Retreat for a brief article about the previous National Oblates retreat held in February 2012.